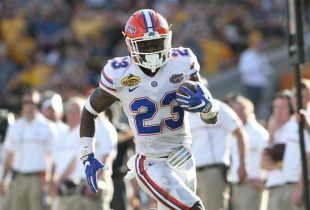 It is no secret that the Florida Gators have been out-recruited by in-state rival Florida State over the last few seasons. And as the end of the 2015 cycle approaches, it is obvious that the Gators have been out-recruited by the majority of teams in college football over the last year, a tide that new Florida head coach Jim McElwain was looking to turn before he even held his introductory press conference. 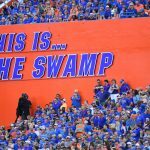 Due to a lack of overall success on the field, an inability to produce offensively and season-long instability at head coach, the Gators currently stand with just eight commitments for 2015, all of whom are three-star prospects and only half of which are from the state of Florida, one of the top recruiting hotbeds in the country. That is where McElwain plans to begin his journey to turn the Gators into a recruiting powerhouse once again, perhaps as soon as National Signing Day in February. Florida’s recruiting class has been a work in progress all season but only dropped to its current level once the Gators’ losses piled up and Will Muschamp was fired; Florida saw its top four commitments – all four-star prospects – withdraw their verbal pledges. Now the Gators are looking to salvage a class that still has nearly 20 scholarships available. McElwain is seemingly taking a page out of the recruiting handbook of FSU’s Jimbo Fisher, who a few years ago pitched the Seminoles as a once-incredibly successful program turning over a new leaf following Bobby Bowden’s retirement. With the failed Muschamp tenure now in the past, McElwain hopes to show recruits that things have changed at Florida with things looking up for the state’s flagship program. With a non-contact period existing during the holiday season, McElwain is stuck in limbo and unable to meet with prospects again until the new year. Once the calendar turns, McElwain is prepared to “hit the ground running,” which should be easier now that he appears to have both his coordinators locked up. But what exactly is McElwain looking for out on the recruiting trail? Explosive talent that will fill holes and build roster depth. McElwain has a lot to accomplish and little time to get it done with plenty of prospects enrolling early in January and National Signing Day set for February 4. Nevertheless, he remains confident that Gators fans will be happy when they see the incoming class Florida assembles in the next six weeks. This is so nit-picky and has no bearing on anything substantive but it’s “orange and blue” not “blue and orange”. 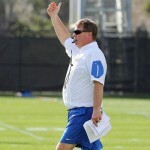 Other than that, Coach Mac has me stoked for the future of Gator football. He said a similar thing in another interview and said “orange and blue,” but the quote was not as good. I don’t think it’s “nit picky” at all. He needs to get it right. Recruits nowadays in this state certainly know it’s O&B. Martez Ivey grew up a Gator fan & I read Cece Jefferson’s dad has a Gator head tattoo so if Mac goes into those homes saying “Blue & Orange” they’ll think he’s a fool. I disagree, I’m a current student at UF and me and all my friends tend to say Blue & Orange almost exclusively, almost to the point where it is awkward to switch it to your way, But there’s nothing wrong with either way, we’re all gators! Yes we are all Gators Jeremiah. In that vein I urge you and your friends to get it right, it has always been, it will always be, and it is right now ORANGE and BLUE. Having said that I don’t think it matters to the recruits if Mac twists it around sometimes as long as he gets it right most of the time. Go Gators let’s all cheer for the Orange and Blue!!!!!!!!!!!!!!!!!!!!!!!!!!!!!!!!!!!!!!!!!!!!!!!!!!!!!! It’s kind of a sad state of affairs when it becomes “blue and orange” just like “me and my friends” backwards grammatically from a college student becomes the norm. Marc, I reacted the same way when I saw it. Ha ha! That is so funny, guys, because I was thinking the exact same thing as I read the article. In all fairness, he’s still in a little bit of a honeymoon period. He’ll get all of that stuff right and straightened out. The guy is obviously extremely bright. You can tell just by listening to him or reading his quotes. He’ll get it figured out, and quickly. Go Gators!!! Orange and Blue, baby!!! Not sure if you would know this, but have you ever seen a situation like this going into the new year where there’s a pretty barren recruiting class but the coach fills it up? Or is it simply too little too late? +1, except for that I might like the Nussmeier hire a little bit more than you do. Otherwise, agree on all points. I wonder if this is whom Mac had tabbed all along being the fact that he was on the market since early December. I guess if it was and Nuss accepted a position on staff then Mac has his own timeline on making announcements public. There is nothing to really dislike about the OC hire at this point as this new coach and staff brings a clean slate along with the hopes of breathing new life into the program and cultivating a winning culture. I hope you are right about Jefferson, Cowart, and Ivey but if they don’t choose UF I won’t be surprised. Mac has a lot of work to do in a small time window and it might be too much to expect to cultivate relationships and trust with kids he had not been recruiting before until now. Mac seems to be a coach with a plan with the intent to execute it. From an outside perspective in reading his quotes he seems adaptable to change what doesn’t work and not a rigid one way thinking coach. If that holds true then that bodes well for the program in every area in my opinion. Mac knows, as well as we all know, that UF needs to get back to getting their share of the elite difference making players in-state. It has been slanted in favor of that school in Tallahassee and some of those elite kids whom liked UF have left the state as well. He knows that needs to change and right now the fact that he acknowledges that publicly and is going to work his but off in changing that is like music to my ears. I hope he gets it rolling like you said with a top 10 class but even if he doesn’t I expect that he will. Whatever he gets in his first class it will be important to develop that talent and display a much improved consistent offense & special teams with very little defensive drop off. If he builds it they will come and UF will be back where they need to be which is right up there with the elite of elite programs at this time of year. You can take that 2 ways, it may be his way of saying that some players are now looking at UF that haven’t before, but if you parse it with the rest of his state “and others who haven’t made up their minds yet”, it sounds very much like they already have some pocket commitments. I would bet they are those I have been mentioning as “probables” but since the staff isn’t allowed to talk about the specifics in recruiting, the kids are going to announce on the national stage such as the UA game.